What on earth do you buy for someone who only ever thinks about training? You could buy them some new equipment, but unless they know exactly what they want then that could be a risky decision – especially if you’re someone who doesn’t train at all! Well we’ve decided to help out a bit, by sticking together a list of some pretty cool things which most fighters would appreciate. Note: We’re not sponsored or endorsed by any of the products in this article. Any suggestions are based on our own experiences, but as usual we advise that it’s always best to look around and read up on reviews before you buy. Buying boxing gloves can be a hard present to buy without knowing what the other person likes, but if you look for something unique, then it will go down a treat. Speaking from experience, there’s something nice about being gifted a pair of unique boxing gloves, and seeing as a well kept pair of gloves can last years, they’re guaranteed to see a lot of use. Obviously boxing gloves can be a higher cost item, but you have a few options. If your budget is fairly high you could look into designing a pair of gloves completely from scratch, complete with whatever materials, colours and designs you feel they will appreciate. There are a number of great brands offering custom boxing gloves. Alternatively some brands offer a personalisation service, where you can have a pair of stock gloves printed or embroidered with text or logo of your choice. Muay Thai brand Yokkao Boxing are well known for offering this service for their gloves. The problem with training 24/7 is that you end up producing a lot of sweat, which can end up getting into your fight gear and eventually start to ruin them. Glove deodorisers are nifty little inserts which go into your gloves or gym bag and help avoid moisture build up to keep things fresh. While it may not be your first idea for a gift, the’re actually super helpful and not too expensive. Check out a few different ones from brands such as No Stink and Meister here. A fighter can never have enough hand wraps. Using hand wraps every training session means that you need a steady rotation of wraps, so that you don’t end up using still-sweaty wraps from the session before and so that you have plenty of backups when it’s time to wash them. It’s hard to go wrong when buying hand wraps, and you can get almost any colour imaginable. If you want to play it safe though, you can always try and find out what brands they use already, or check out our own Hand Wrap reviews to find a decent pair. Decent quality training shorts can be a little pricey, so they can often be a great gift. Having plenty of pairs of shorts available also means they aren’t always wearing the same clothes to training, which can help bring some variety to their sessions. There are plenty of great designs available. Boxing shorts are often a little plainer, but the custom made options out there can be really unique. Brands such as Hayabusa and Venum produce some great options for MMA fans and InFightStyle and Yokkao are frequent favourites among Muay Thai crowds. Seems a bit of an odd one, however a skipping rope makes a nice gift. Most people go cheap when buying a rope, so it’s a perfect chance to buy something nice that they often wouldn’t buy for themselves. Boxers and other fighters will often skip as a warm up before every training session, and it’s a great way to get the blood warm so it’s bound to get plenty of use. We wrote about the Adidas Weighted Skipping Rope Set a while back, which comes with a great case and multiple ropes/weights, but there are plenty of other great speed ropes or weighted ropes available on the market. Everybody forgets about their gym bag, which is why it can make such a great gift to pick up a new one for someone. Most people will make do with the same old bag for years, but there are plenty of unique, high quality gym bags available with a load of features packed in to refresh their experience. Some Gym bags (such as the Ryoko Bag from Hayabusa) are constructed with plenty of mesh panels to ensure the bag breathes properly, which is perfect for avoiding any smell build-ups. When training regularly it’s important to keep your protein levels up. There’s nothing worse than using a cheap plastic protein shaker which doesn’t really do the job though. If the person you’re buying for gets plenty of use, then it’s worth looking into getting a really high quality protein shaker, for example this Shaker with a classy metal finish, or even a step up from there with an electric protein mixer. A T-shirt says a lot about a person, and a T-shirt representing a passion or interest can be a great gift. You could look into buying a T-shirt of their favourite fighter, or possibly even just representing the sport they love. 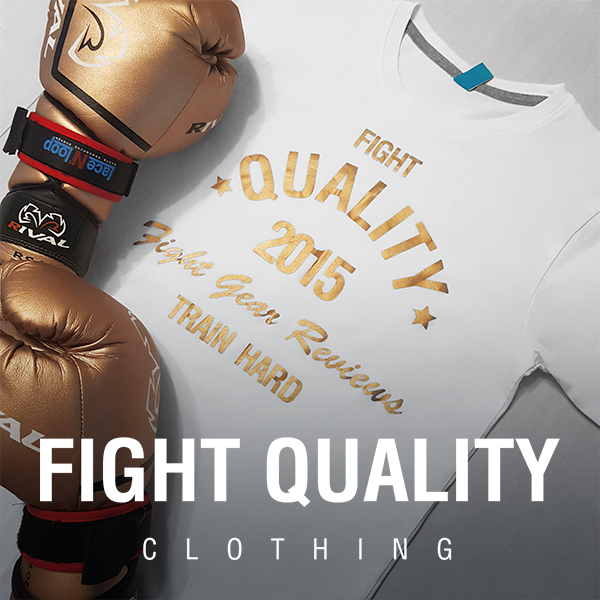 Here are our suggestions on The Best T-Shirts for Boxing and MMA Fans, or why not check out our own range of T-shirts, including our Boxing, Kickboxing or Muay Thai inspired Tees. ← Have RDX Unveiled the Future of Boxing Gloves?